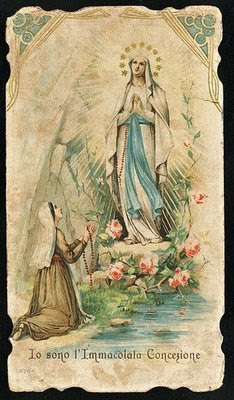 Our Lady of Lourdes: "be glad because of her"
... all you who love her." Blessed art thou among women and blessed is the fruit of thy womb, Jesus. After the angel's greeting, we make Elizabeth's greeting our own. "Filled with the Holy Spirit," Elizabeth is the first in the long succession of generations who have called Mary "blessed." "Blessed is she who believed. . . . " Mary is "blessed among women" because she believed in the fulfillment of the Lord's word. Abraham. because of his faith, became a blessing for all the nations of the earth. Mary, because of her faith, became the mother of believers, through whom all nations of the earth receive him who is God's own blessing: Jesus, the "fruit of thy womb."